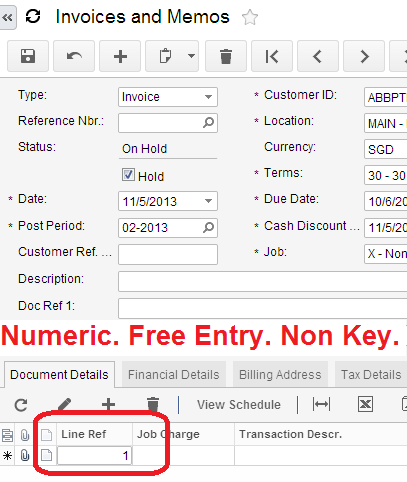 Acumatica Singapore: Importing Invoices. Multiple Lines. Multiple Times. Using Search Function. Importing Invoices. Multiple Lines. Multiple Times. Using Search Function. One of our customers importing Invoices from ageing Oracle based system into Acumatica. I will skip here technical aspects of this integration, just mention it is done via MS SQL Integration Services, data from Oracle DB are placed on to our Azure SQL server. Main issue is not Oracle->SQL transport but the interface dynamics. Customer has multiple lines in the invoice with each line having its unique number per invoice. Also customer wants to import into Acumatica multiple times, and that the SAME Invoice will dot be imported twice or lines will not get duplicated. This can be achieved by adding a user field into Invoice Transaction area, and then modifying Import Scenario to look into that field before inserting a NEW transaction line. Here is additional field added to Transaction Line, you may refer to my earlier posts on how to add a field to grid and map it to the database. 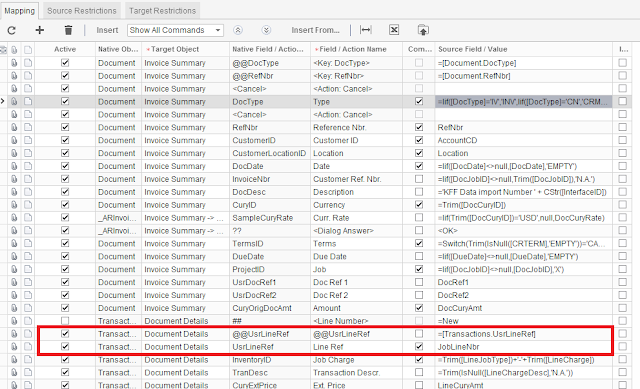 And then, at the Interface Import Scenario we should indicate Search parameter to be Our newly added field. 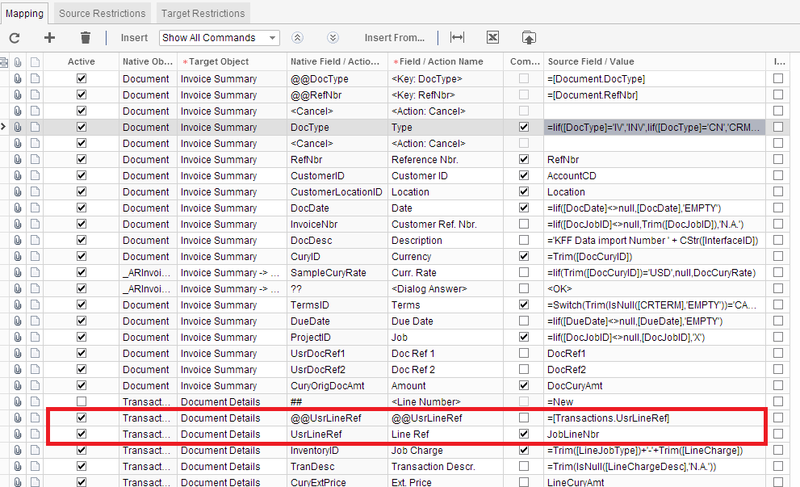 Then next line we should indicate that this parameter should be tally to importing data file. @@UserLineRef will be a search variable, that is used to compare content of LineRef customized field and JobLineNbr field from the importing data. As a result we can import the same file multiple times without the risk of duplicating the line data.